Ever since I could hold a crayon in my hand to write my name, I’ve needed an editor. And God, in His infinite wisdom, gave me a mom with an eagle eye. 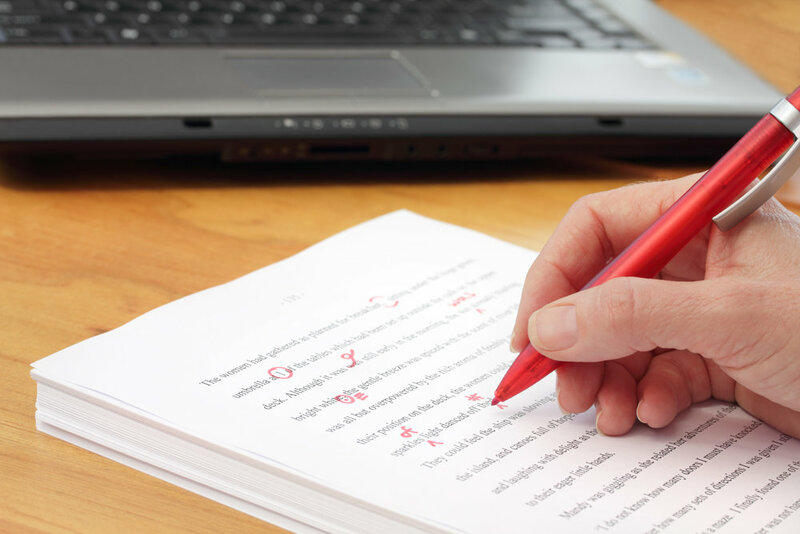 The Supreme Editing Queen had red ink coursing through her veins. Her “gift” was especially problematic for me in my high school and college years; she had a lengthy track record of shredding my research papers with her trusty red pen. “Mom,” I’d often exclaim. “This paper is due in the morning, and you’ve left me with a bloody massacre.” I was seeing red, literally and figuratively. As if my waiting until the last minute to complete my assignments was in any way her fault. She’d calmly walk away, while I dragged myself back to the typewriter to make the needed corrections. For most of my thirtysomething years after college, I didn't write. From 2004 through 2011, I penned a few newsletter columns for our autism support group, occasional feature stories for a church magazine, and several contributing articles in a devotional book that was published by the same church. But there were years in between those projects that yielded nothing. I lacked discipline, and feared exposing myself as a writer to the world-at-large. But in October 2014, it was time to be true to my calling: Writing. All my life, I’d wanted to be a writer; it was time I started acting like one. After asking my friend Annie to be my writing accountability partner, I began writing daily. And after 11 months, I had a manuscript of 324 double-sided pages. Ready to take the next step toward publication, I contacted Max Regan, a developmental editor with Hollowdeck Press, www.hollowdeckpress.com. He sent me formatting guidelines and instructions on how to submit my manuscript, and we set a deadline for it to arrive on his doorstep. I had three weeks to get it ready; I was applying the cleaning-before-the-maid-comes mentality to editing. There was no way I’d send Max my work without having someone else edit it. I needed someone honest, someone with years of experience, someone with perfectionistic tendencies. In other words, at 52 years old, I needed my mommy. She was detailed, thorough, and had taught me, as well as countless others, how to refine my skills as a technical editor. After years as professional editors, our leisure reading was forever tainted. Neither of us could drive through Houston without correcting errors on billboards. Since we didn’t have a 14-foot red pen on hand, we edited the boards mentally. We also found mistakes in books we read, some by bestselling authors, which always made me feel better about myself; it was writer therapy. I asked Mom to edit my manuscript, explaining that I’d continue to edit too, and she was happy to help. I emailed it to her in parts. She preferred hard copy, so she printed pages out and marked them up with, of course, a red pen. One day, as we were seeing light at the end of the paper tunnel, I told her we had a few more chapters left. “About 10 more,” I answered, my guilt sufficiently intact. “Oh my.” She sounded weary. My mom, the McAdoo Marvel, waded through all 134,912 words of my manuscript. We both felt victorious the day I mailed it to Max. My phone conferences with him, and subsequent meetings with the talented web designers at Wingman Web Works, www.wingmanwebworks.com, set my dream in motion. But before launching my website, I had more deadlines; I needed 13 articles for my debut. Although my manuscript was a strong first draft for hundreds of future articles, I needed to create ready-to-publish stories. I wrote, edited, rewrote, edited more, etc. for weeks. And, once again, I employed Mom’s expertise. Throughout all phases of beginning my writing career, I continued to write daily. There was always something to write about. Which meant there was always something to edit. For a year and a half, Mom and I worked together. Each week, I wrote a first draft, then edited, then Mom edited. Then we edited the second draft, and often a third draft. Week after week, this was our routine. But in the midst of our teamwork, Mom was becoming weaker. There were times when I could tell she wasn't up to editing, so I didn’t ask for her help. But she never forgot about my dream, the hard work it entailed, and my deadlines. With every hospital stay, every rehab stint, every three-steps-forward-two-steps-back experience, she'd always ask, "How's your story?" or "Did you get your story out?" She could've been fleeing a burning building, but still she would've screamed, "How many people saw your story this week?" One day last year, she asked, “What are you going to do when I’m gone?” We were in the habit of talking about the end of her life, but she’d never made reference to how I’d cope with her death. My laughter camouflaged my tears, as I answered, “Well, I guess you’ll just have to come back now and then to help me out.” Inside, I shuddered; I know the depth of my need for editing, both in writing and in life. I would miss her for both. Dear Lord, deliver me from my grammar sins, both now and forevermore. And lead me in the ways of competent editing, I prayed. Not only did Mom edit for grammatical errors, misspellings, etc., she also helped with factual accuracy, tone, and ease of reading. “I was worried about that,” I replied, before quickly making changes. She always confirmed what my gut was hesitant about, and often caught what I’d missed. “You don’t need to explain so much,” she said, referring to a different article. “It sounds like you’re simply reporting facts. Your readers are intelligent; they’ll understand your inferences.” She was right. My readers caught on quickly, as they still do. Last October, editing became more difficult than ever for Mom. Her mind was still sharp, but her strength was lessening, and daily living took most of her energy. So I had to rely on my own editing training, my reference books, and the almighty Google, to help with things I’d forgotten from my full-time editing days. I missed her input, although she still took time to read my stories. Most of the time, I made my deadlines. But when caring for her became more involved, I needed a Plan B. So, I asked Mom if she would be my guest author on busier weeks. “Oh no. I don’t know if I can do that,” she replied. “No, Mom. I don’t mean write new material. I want to post the stories you’ve already written for me.” Twenty years prior, I’d requested her childhood stories as a Christmas present. I received only one; she said “I was a little busy” when I brought it up last year. Indeed. She was my rock and my sanity in helping with Cowboy for many years. But in 2017, at 90 years old, she finished them all. “Oh, yes. You can use those stories,” she replied, once again coming to my rescue. Suddenly, our roles changed; I was editing her writing. On one particular day, she wasn’t pleased with her first draft I’d edited. “It’s not right,” she said. “It’s not in the right order.” She proceeded to tell me, at length, the chronological order in which her Uncle Rush opened his two different stores in West Texas, stores that were referred to in her story. I understood; she had to be true to herself. We write for ourselves first, then we share it with others. Nothing less will do. “Okay. You’re the writer, and we need to fix this,” I replied. After an hour and a half of talking, editing, rewriting, and more editing, I read the completed draft to Mom. “That’s it,” she said, as we both sighed with relief. It was one of the most rewarding stories we worked on, and I loved that she was adamant about its being historically accurate – proof of her clear mind in the midst of her failing health. Since her death, I’ve felt lost in many ways. Missing her editing, I asked my friend Lylas to look over a couple of my stories before publication. She gave honest feedback, and corrected errors. I sent another story to my friend Rosebud; again, I received valuable input. Still, I wanted my friends to enjoy my writing in its completed form, when it posted on Wednesday afternoons. But my only other option was to recruit Flash, and it’s a scary thing to ask your spouse for constructive criticism. It could open the floodgates, I told myself. Still, I needed a second set of eyes; without a weekly editor, I was on a tightrope with no safety net. He obliged. “It’s great. I love it,” he said, after reading it. As if he read my mind, a skill I’d often wished he had for the previous 24 years, he continued, “It flows, it’s funny, and I understood everything. I wouldn’t change anything.” Then he described, in detail, the lesson learned in the story. That was all I needed to hear before preparing it for publication the next day. After that, things went smoothly each week. I sent my first draft to Flash, and he gave me feedback. I was excited he was actively participating in my writing dream. A new life phase had begun, and all was well. He began reading my article on his phone, and I plopped down beside him. After seven minutes, the room was still eerily silent. There was no laughter. No smiling. Nothing. “No, it’s not awful. Let me finish reading it,” he replied. Again, silence ensued. Even the crickets outside held their breath, waiting for Flash’s verdict. After 10 more minutes, I glanced up at Flash. His eyes were closed. Under the influence. My entire writing reputation hinged on the opinion of a man under the influence. My Zombie Editor sat up, trying to convince me he was alert. “Did you read the whole thing?” I asked. “Too long? Not enough dialogue?” I was trying to help him communicate, since he’s not the most eloquent man on earth while mostly asleep. Boring? He did not just say “boring” to me, I shrieked to myself. I felt a shift in the earth’s tectonic plates. All the oxygen was sucked out of the room with that one spoken word, as if a window had shattered in the airplane that was transporting me to the Land Where My Writing Dreams Come True. And then, he was peacefully falling asleep again. “Do you mean uninteresting? Complicated? I should shred it, then burn the fragments in the fireplace? Because any of those options would be easier to take. But boring?” I pantomimed stabbing myself in the heart, then twisting the blade. “Nobody ever said ‘boring.’ Until you. I thought maybe it was too much like reporting – like a news story,” I suggested. In spite of my bruised ego, I was grateful. He’d confirmed what I’d felt in my gut, the way Mom used to. I knew my story was boring, but I’d needed a more objective opinion. So, that article was put on the back burner, tucked away for another day. I can’t force stories to be ready for publication. But when a story’s ripe, and I hit that “Publish” button on my website, I walk away from my laptop with a smile on my face and a bounce in my step, as a ripple of exciting fear washes over me. And then the weekly writing-editing process begins again. In Mom’s absence, others have come to my rescue as a second set of eyes. They’re standing in the gap left by her departure, and I’m grateful. Still, I miss her red pen and our editing discussions. But frequently, I hear her voice in my head, saying things such as, Go back and look for dangling participles. Check for verb tense throughout your story. Make sure your gerunds are modified correctly. So I take her advice, reading over my article once again, and knowing that forevermore she’ll be editing for me from heaven.